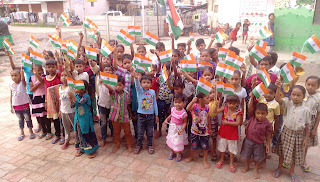 Vadodara (Gujarat), August 2017: Roshni Don Bosco organized the ‘Independence day’ and ‘Janamastami’ celebrations with fun and frolic for more than 300 under-privileged children from 3 slums of Vadodara city. The celebrations were held under the aegis of ‘Education Project’ supported by Manos Unidas (Spain). 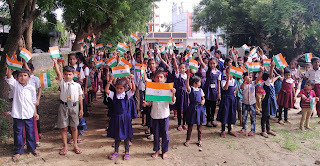 The day was marked with remembering freedom fighters and saluting the national Flag. 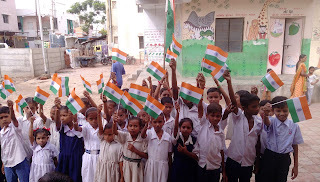 It was a moment of pride for the children to watch tricolor unfurl in their own locality. 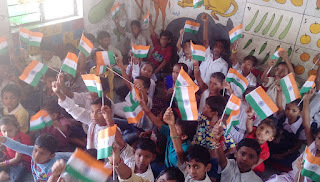 Children came with their own flags made of paper to celebrate this national festival. 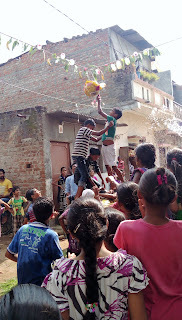 Since it was also Janamastami (a Hindu Festival) so in afternoon children celebrated this festival in their locality. 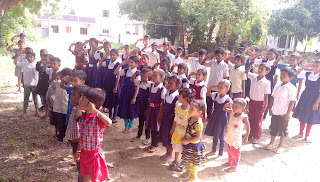 The children who attend the study classes were joined by their teachers in these celebrations. The whole environment was filled with joy and cheer. 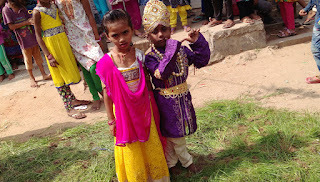 Small children dressed-up as ‘Govindas’, Radha and Krishna attempted to reach the Handi and finally were helped by elder children to break it. Snacks prepared by Self-Help Group women were distributed to all and children went back with memorable experience of festival celebrations.